New Walk issue 2 is now available! New poetry from Alice Oswald – the only section of her forthcoming book Memorial (Faber, 2011) to be published in a magazine. Also poems by William Logan, Carrie Etter, Tom Pow, Iain Bamforth, Helen Tookey, John Whitworth, Alan Jenkins, Ian Parks, Jean L. Kreiling, Gareth Reeves, D.A. Prince, Martyn Crucefix and many others. Essays by J.M. Coetzee on Zbigniew Herbert, Martin Stannard on Philip Larkin’s Letters to Monica, John Pistelli on Gabriel Josipovici and the burden of modernism, and others. 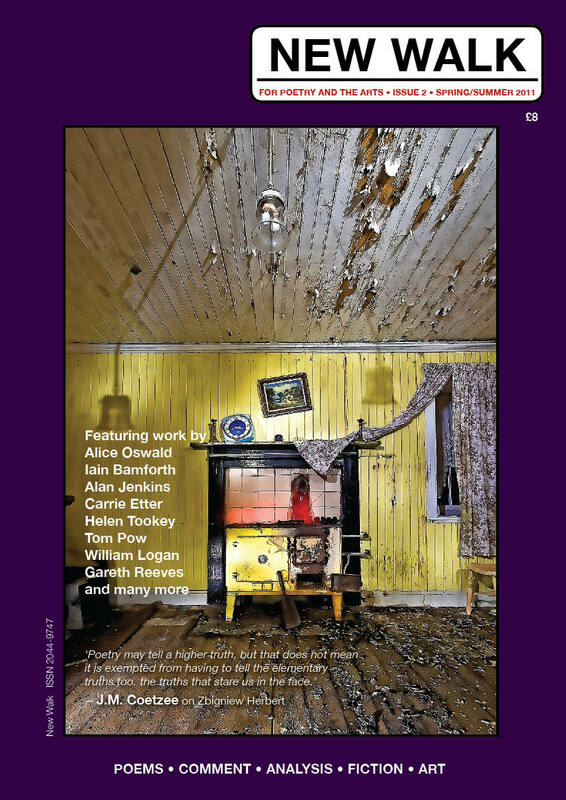 Fiction by Bill Jones and Robert McGowan, and artwork by ‘Flying Monk’ John Maher, Clare Johnson and William Jackson. As usual, the issue also contains a sizeable reviews section, and more. 1 Response to New Walk issue 2 is now available!